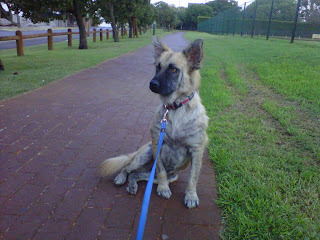 Max went on his first walk on Sunday evening, a whole 700m round the corner to Western Province Cricket Club. Lots of new sights and smells. Cars, other people, people on bikes, children, barking dogs, hadedas, etc. I kept him on the lead as he was quite skittish and unsure of everything. He managed to slip his collar at one point when something startled him but stopped dead in his tracks when I told him to and sat down... good boy. We need to work on his recall quite a lot because I think if he gets distracted by other dogs he won't listen at all. The fur is growing nicely and improves each day. He is also getting more and more energetic (hence the walk), he has a football now which he absolutely loves chasing and kicking around. The vet wants to wait a bit until he has completely recovered from the mange treatment before he gets vaccinated and neutered. It will be great when I can introduce him to other dogs. He will also be able to make star appearances at the African Tails adoption days and hopefully find a great permanent home.